Bruder’s latest award-winning toy release gives a miniature makeover to the gritty world of construction machines. 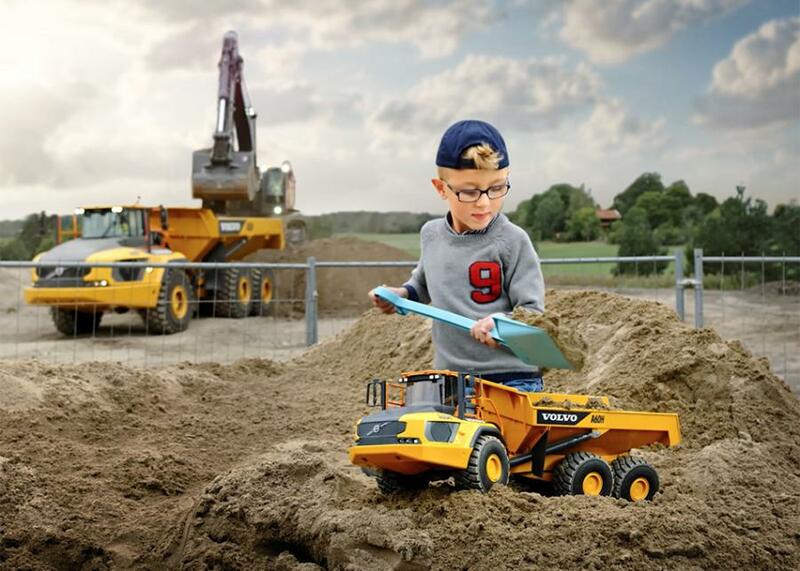 Bringing construction to life in the imaginations of children around the world, the 1:16 toy model of Volvo CE's A60H articulated hauler provides children with the "real-world" experience of handling one of the industry's top heavyweight machines. With a payload capacity of 55,000 kg and a body volume of 33.6 cu m, the A60H is an engineering powerhouse — the biggest articulated hauler in Volvo CE's range, in fact. Now it is available as a 1:16 toy model from Bruder, one of Europe's leading toy manufacturers, and is perfect for indoor and outdoor play. Just like the real thing, it has articulated steering, large wheels and all terrain bogie, as well as a comfortable cab for a mini operator to sit in. "You're never too young to own your first Volvo machine," said Tim Birks, global business manager at Volvo CE. "Although it's relatively small, it's big in toy terms. It really does look like the real thing! I think it will be on lots of wish lists this Christmas." The incredibly lifelike model has already earned plaudits for its innovation, design and high functionality, winning a pro-K award in the toy category at the annual consumer manufacturer awards. The jury recognized the toy's ability to spark excitement in the eyes of young hauler drivers and was particularly impressed by its off-road capabilities and realistic tipping function. Construction toys are consistently hailed by experts as a great tool to boost children's development. Which is why the toy's creators are proud to be putting their young customers in the driving seat. Paul Heinz Bruder, managing partner of Bruder, said: "Children orientate themselves to the world around them. They want to recreate the same things they see every day. Role play like this can be a great tool for social development and provides an emotional connection that makes playtime more real. It's something that electronic devices simply cannot achieve in the same way." Volvo CE has enjoyed a long-running collaboration with Bruder that goes back to the 1980s, when the toymaker's then MD Heinz Bruder released a six-wheeled Volvo articulated hauler. The Volvo A60H Kids Toy is available from toy stores and the internet.